Save yourself time and money reading informed reviews of some of the best books about NLP for personal development, business, and changework. If you like the sound of any of these books you can order them direct from Amazon in the UK or US by clicking on the appropriate link. In the course of my work as NLP trainer and coach, I naturally have read a lot of books about NLP and related subjects. Some were excellent, others not really worth the time and money. I remember how confusing it was when I was starting out in NLP – so many books to choose from, so little time – and I could really have done with a site like this. The idea is to help you make a more informed investment of your time and money. 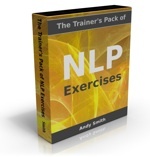 What kind of NLP book are you looking for?